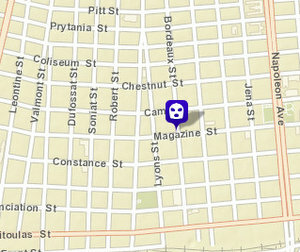 A woman was robbed at gunpoint as she left a Magazine Street bar early Saturday, police said. The victim was leaving Les Bon Temps Roule at Magazine and Bordeaux around 3 a.m. and headed back to her vehicle nearby when she heard footsteps in the gravel approaching, said Officer Hilal Williams, a NOPD spokeswoman. She turned to see a man armed with a silver handgun who demanded her property, and she gave him her purse with her debit card, ID and iPhone, Williams said in an email. The gunman escaped on foot. Dear NOPD, please patrol the Bouligny neighborhood. Vagrants hanging out in front of the Rainbow Food Store, the Pick n Pack and Danny’s Fried Chicken #2 on Magazine Street are constantly walking around the neighborhood lately, throwing trash around and probably committing all of these robberies. Robbery, especially armed robbery, is a horrible thing to happen to someone, but clearly, this could have been avoided. We live in a city where crime is reported constantly, if you think you can walk in dark alleys in the wee hours of the morning and not get mugged, your wrong. You should not take chances, anyone who lives in a city has to be responsible for themselves. Don’t let your guard down. I agree, but this wasn’t a dark alley. This was a pretty popular bar on a busy and residential street. Yes, it may have been early morning hours, but people shouldn’t have to feel like “pumpkins” should they stay out past 12 am. It is basically a “dark alley”. Very poor street lighting. THREE armed robberies on Bordeaux in less than 2 weeks. Where is the police presence here?? These thugs obviously have a great fear of getting caught after targeting the same area again and again..these criminals are almost making this too easy on the NOPD, but yet, I haven’t noticed a police car on that street in months…can we get a little help here?? Police have been to the neighborhood recently. 2 police cars came a few weeks ago when we had someone tapping on bedroom windows in the middle of the night. The cops seemed more freaked out than the residents, which worried me more than the window tapping. A few weeks before that, there were a couple of police that showed up for a serious bar fight at Bons Temps, involving at least 10 people. But patrols? Nope, none that I’ve noticed. You’d think they would have somebody posted right there every night, with the number of recent incidents that have been reported. Its a bad situation being robbed at gunpoint. Ask security to walk the patrons to their vehicle to ensure their safety. Good idea, but most nights there is no security there. Sorry to say, this robbery is not a surprise in the least. I live right on the corner of Bordeaux and Magazine, and constantly observe the goings-on of that particular part of the neighborhood. Though I do have some love for the Bon Temps, it is without a doubt a magnet for trouble. Since it’s one of the only night time “destinations” in a several block radius, I suspect that it attracts more than its fair share of dangerous and dysfunctional people. Would-be criminals gravitate there for the easy pickins of late-night drunks and revelers. There are plenty of places to hide in the dark, waiting for the perfect victim. The Rainbow Store and Danny’s ping-pong thugs back and forth, and with the Bon Temps right in between, it’s amazing that this sort of thing doesn’t happen more often. That particular stretch of Magazine is a never-ending flow of chaos, compounded by poor street lighting, horrendous street/curb maintenance (had to chuckle a bit re: the crunching gravel part of the story), a high percentage of renters (self included), and pathetic disrespect of the neighborhood by owners who leave trash and destroyed furniture on the street corner for months on end (the neighborhood “vet”). The addition of the BBQ joint will only make the current cluster###k worse. We will be departing this block very soon, I hope. Carjacked SUV recovered, but without missing dog “Skeeter” Owen Courreges: After Sandy, should New York City be moved inland?